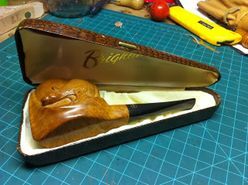 Roy Brigham, after serving an apprenticeship under an Austrian pipesmith, started his own pipe repair shop in Toronto, in 1906. By 1918 the business had grown to include five other craftsmen and had developed a reputation across Canada for the high quality of workmanship. 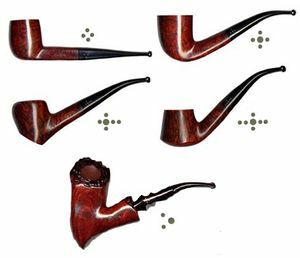 After repairing many different brands of pipes over the years, Roy noted certain recurring complaints by pipe smokers, the most common referred to as "tongue bite". Tongue bite is a burning sensation on the smoker's tongue, previously thought to be due to the heat of the smoke (i.e. 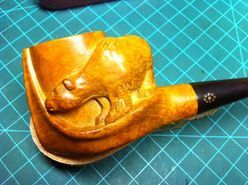 a "hot smoking pipe"). 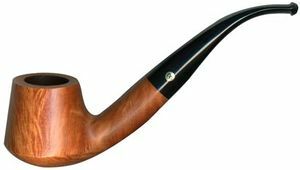 He soon began manufacturing his own pipes, which were lightweight, yet featured a more rugged construction, strengthening the weak points observed in other pipes. The problem of tongue bite intrigued him, and he decided to make overcoming it a future goal. About 1938, Roy’s son Herb joined him to assist in the business. The business barely survived the great depression because pipes were considered to be a luxury, not a necessity, and selling pipes was difficult indeed. In approximately 1937 , after some experimentation, Roy and Herb discovered that tongue bite was in fact a form of mild chemical burn to the tongue, caused by tars and acids in the smoke. 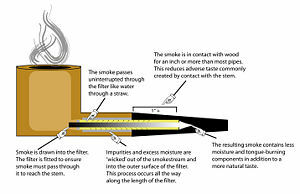 They found that by filtering the smoke, it was possible to retain the flavour of the tobacco and yet remove these impurities and thereby stop the tongue bite. 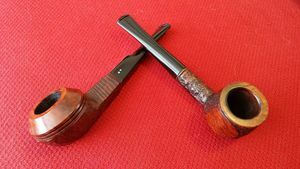 Just as Thomas Edison had searched far and wide for the perfect material from which to make the first electric light bulb filaments, Roy & Herb began experimenting with many materials, both common and exotic, in the quest for the perfect pipe filter. Results varied wildly. Most of the materials didn’t work at all and some actually imparted their own flavour into the smoke. They eventually found just two materials that were satisfactory in pipes: bamboo and rock maple. As bamboo was obviously not as readily available, rock maple then became the logical choice. 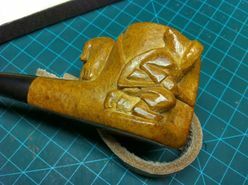 They were able to manufacture a replaceable hollow wooden tube made from rock maple dowelling, which when inserted into a specially made pipe, caused absolutely no restriction to the draw of the pipe, yet extracted many of the impurities which had caused tongue bite. 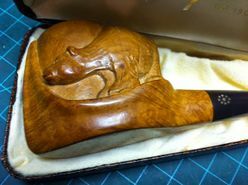 The result was indeed a truly better smoking pipe. 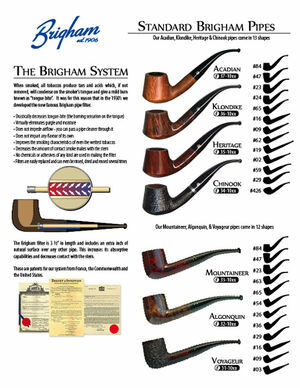 As a result, sales of Brigham pipes climbed briskly afterwards, and by the 1960’s there were well over 40 full time production staff. 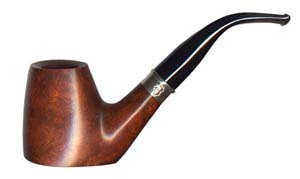 For over four decades now, the company has been the leading Canadian pipe manufacturer, producing more than three quarters of all the pipes made in Canada. 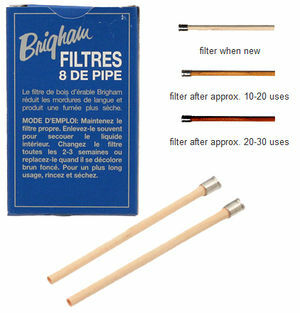 In 1978, Roy’s grandson Mike joined the firm and together with Herb (now in his 80s) they still produce pipes and wooden filters according to long established techniques, resulting in consistently high quality products. 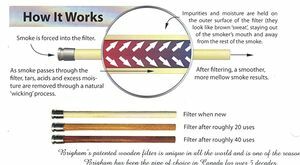 Several pipe makers who learned the craft of pipe making here at Brigham went on to make a name for themselves in Canada and internationally including Philip Trypis and Julius Vesz. Al Lanman reports seeing in the obituaries of the Toronto Star October 2, 2010 that Roy Brigham's son Herb died Sept. 30, 2010 at the age of 94. the photo show shows him with a Brigham freehand clenched in his mouth. 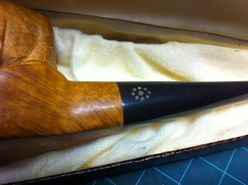 See Brigham Pipes – A Closer Look at Dots, Dates and Markings for a fantastic article by Charles Lemon, originally posted on DadsPipes.com. This page was last edited on 31 March 2019, at 14:21.